Your donation reminds children that life is worth fighting for and parents of patients that they are not alone in their struggle to provide their children the care and support they need. Cancer doesn’t take months off, and neither do we. Day-to-day family support takes ongoing support. Help us adopt a family with your monthly pledge drafted automatically. 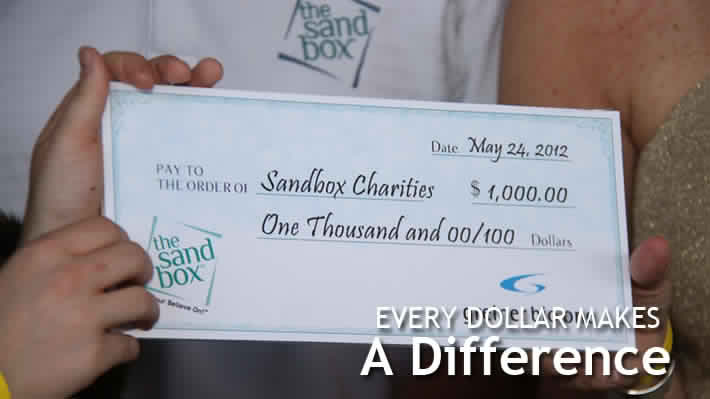 Donate valuable goods and services for online and silent auction at The Sandbox events. Make the holiday a time of joy by providing specific gift requests of patients and their families. Contact us for information on matching gifts, planned giving, stocks, etc. Make a donation in honor or in memory of a loved one. On the occasion of their birthday, celebrate their life by touching a life. At your next party or special event give your attendees a chance to change the life of a child in honor of the occasion. Email us for information on table cards and event invitations to show your support in style.